We believe that housing is the foundation upon which whole families can build stable, thriving lives, and a safe, dignified home should be accessible to families living on lower incomes. Hacienda has built and rehabilitated 376 units of affordable housing in and around Cully. The properties feature hard-to-find 3 and 4 bedroom units that can accommodate the families we serve. If you are looking for housing, please visit Hacienda’s website and call the property directly to inquire about current vacancies. 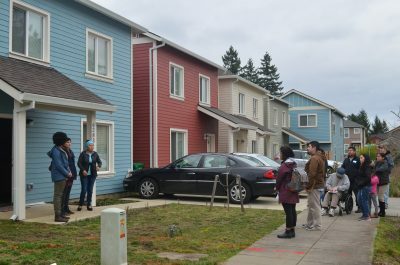 “Affordable Small Homes” is a Hacienda CDC- and Verde-led Living Cully project in partnership with Portland Community Reinvestment Initiatives (PCRI) and ROSE Community Development, that lifts up Oregon’s first affordable accessory dwelling unit (ADU) program, designed to serve low-income homeowners and renters. The pilot program will create a replicable model for constructing, financing and managing ADU’s across the Portland metro region on properties owned by lower-income people and in neighborhoods where people of color are most at risk of displacement. The new affordable rental homes are then made available through community-based organizations to low-income people of color and other households at risk of being pushed out by gentrification. Cully Builds Site: Habitat for Humanity Portland/East Metro is proud to be building 15 new affordable homes in Portland’s vibrant and diverse Cully neighborhood. Construction started in summer 2018 and seven of the 15 homes are predicted to be move-in ready in fall 2019. Cully Commons is part of our ongoing Neighborhood Revitalization Initiative, a block by block approach to building stronger neighborhoods. Hacienda CDC’s Homeownership Support Program is a HUD-approved housing counseling agency. They provide group education and one-on-one counseling to first-time homebuyers and homeowners at risk of foreclosure. The services are free of charge and available to all Oregon residents. Hacienda CDC is a national affiliate and active member of the National Council of La Raza (NCLR) Homeownerhsip Network, the largest family of community-based organizations working together to empower Latino asset-building through homeownership. By assisting households in reaching their goals, Hacienda helps build the financial stability that contributes to una comunidad viva! NAYA family center’s Homeownership Program provides culturally specific homeownership coaching, education, and programming that will help you plan to buy, and plan to keep, your home. The program works to increase homeownership opportunities for Portland’s Urban Native Community and close the Native homeownership gap. All of our services are free and we are an equal housing opportunity provider. The NAYA Family Center is a HUD-approved counseling agency. The Homeownership Program offers an orientation to learn about all of the available services. The Home Repair and Preservation Program helps low-income homeowners located in Cully restore and maintain their homes. Habitat partners with homeowners to alleviate critical health and safety issues and complete needed home improvement projects. This program is part of the Neighborhood Revitalization program’s long-term commitment to revitalizing Cully in partnership with residents and Living Cully nonprofit partners. Leaky roof? Lead-based paint? Sagging porch? Habitat can help! 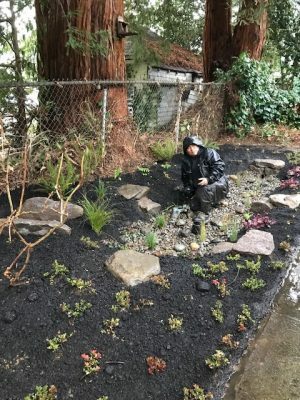 Verde and Habitat for Humanity partner to bring gre en assets and storm water amenities to low-income homeowners in Cully by building rain gardens! Help divert water run-off from your roof into a rain garden of native plants that can help filter water and keep your yard from flooding. Last year Verde’s youth education program installed 6 raingardens for low-income homeowners in Cully. Interested? To apply for the program please contact Nestor Campos at 503-803-0215 or nestor@verdenw.org.